Hello! I’ve been off the radar on the website for a bit now – but I promise I have been doing some stuff. 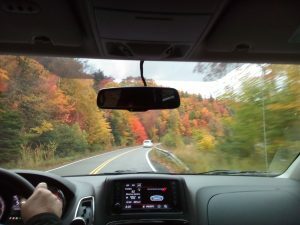 I ended the summer there on a trip to Canada with Conor Markey and Paul McKenna, which was very enjoyable, despite a serious amount of driving (4500 miles in 3 weeks!). We had a fair bit of time off in Halifax, Nova Scotia as well, which allowed me to explore our area of the city a bit and hang out in some cool bars and stuff. In September, highlights included a couple of gigs at Blas Festival as a duo with Hamish MacLeod and with INYAL, as support for Niteworks, who are great craic all round. 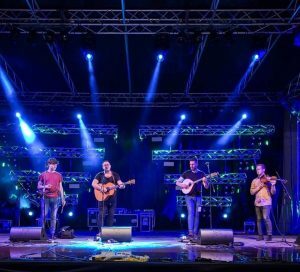 I was also over in Italy at BustoFolk with the full Paul McKenna Band (pictured), where we caught the last of the summer sun and ate our weight in tidy pizzas. Looking ahead, I’m embarking on a two-week tour of Germany, Switzerland and The Netherlands with singer-songwriter Simon Kempston in November – check out the dates in the ‘Gigs’ tab! We’ve just finished tracking an album with Tannara as well, and so are looking forward to mixing it and sharing it with you in the near future. To finish the year, I’ll be heading up to Sutherland to play with INYAL in Ardgay Hall to bring in the bells. We’ll be joined by the phenomenal Heisk, and it promises not to be a quiet night! I’m delighted to be away in Canada this month, on a tour with The Paul McKenna Band. 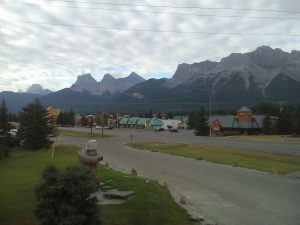 We started off at a festival in idyllic Canmore, near the beginning of Canada’s Rocky Mountains (although the picture I took doesn’t do it any justice). We’ve met some really cool people out here so far, including awesome singer Foy Vance, who we were delighted agreed to play a song with us at Canmore (see video). At time of writing we’re headed up to the famous Edmonton Folk Festival, and then on to New Brunswick. With INYAL, we’ve just finished recording an album, and are hoping to release it this year or early next, so look out for that if you’re interested. We’re very lucky to have BBC Radio 2 Young Folk Award winner Josie Duncan and BBC Radio Scotland Young Traditional Musician of the Year 2017 Charlie Stewart featuring on it. 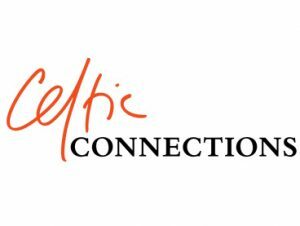 If you want a preview you’ll be able to catch us at Colonsay Festival and Skye Live next month! As the peak wedding season draws to a close, I’m looking forward to playing at a few all over the country when I get back, and also to touring with Tannara in the Autumn.